The $70,000 electric Jaguar I-Pace crossover made up nearly 10 percent of Jaguar’s total sales in October, according to reports. That’s a pretty huge piece of the pie chart for a new, expensive, all-electric luxury vehicle, in a world where a lot of people want more efficient cars but a small fraction are currently buying them. Jaguar Land Rover reported sales of 44,282 globally in October, with 13,764 of them at Jaguar and 30,518 coming from the other half of the name, Land Rover. 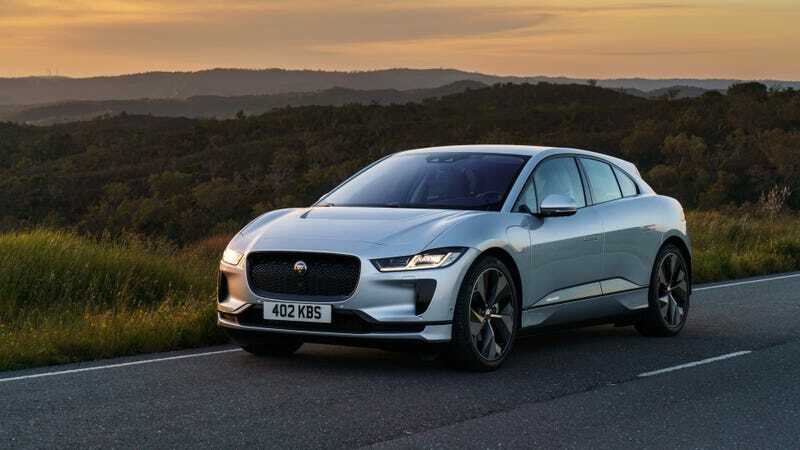 Inside EVs wrote after the numbers came out that 1,200 of Jaguar’s 13,764 sales were of the I-Pace, which would mean Jag’s new EV—rated at 234 miles of range and 394 horsepower—made up 8.7 percent of sales last month. There doesn’t appear to be a breakdown of Jaguar’s sales by vehicle online, so Jalopnik reached out to confirm the reported I-Pace sales and we’ll update this story if we hear back. But going off of the report, a new luxury EV making up nearly 10 percent of an automaker’s monthly sales is a respectable feat to accomplish—especially considering the $69,500 base MSRP for the I-Pace, the second highest starting price in the Jaguar USA lineup behind the $75,400 Jaguar XJ. The thing is, it’s hard to put that feat in context within the bigger picture. Fully electric production cars are still creeping onto the market at about the rate we all get out of bed on a cold morning, meaning there isn’t much out there to compare I-Pace sales with in terms of major automakers. The I-Pace is a luxury vehicle that looks like a crossover from the front and a big, bloated sedan in the back, like a better-looking version of the BMW X6 or that terrifying Maybach concept from earlier this year. We could also compare I-Pace sales to other luxury SUVs, but they’ve got one big difference between them that makes that point invalid—gasoline engines versus electric motors, with the latter being a significant life decision for people who have conveniently driven up to gas stations to refuel their entire lives. For what it’s worth, crossover and SUV sales are soaring across the board, even in that Chevy quarterly report where sales were down overall. Regardless, Jaguar must be doing something right since 10 percent is a larger number than we usually see when it comes to EV adoption, and that’s a good sign for the folks over there—Jag plans to have some sort of electrification in all of its models by 2020, after all. Let’s see if I-Pace sales stay that way.